Squash blossoms are in season and thankfully my mom planted a huge crop of squash that is overgrowing her garden at the moment. She gave me a huge pile of fresh squash blossoms and I promptly brought them home to stuff and fry. Michael had never tasted a squash blossom (crazy, I know.) 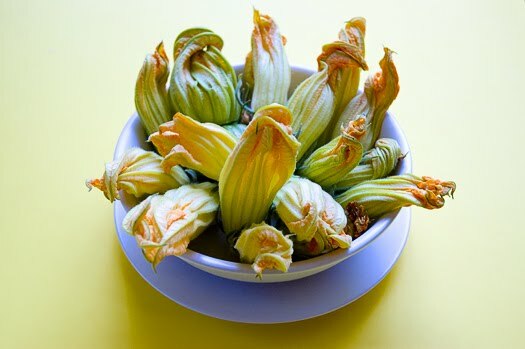 and since our friend was coming over for a cocktail I thought having these stuffed blossoms as a little appetizer would be the perfect way to enjoy them. I used Oaxacan cheese which is like a really flavorful string cheese, but if you cant find it I would substitute Monterey Jack. The best part of this recipe is the batter…I found it in this month’s Gourmet and it is seriously the best batter for frying I’ve ever tried. Up next? Fried Zucchini! 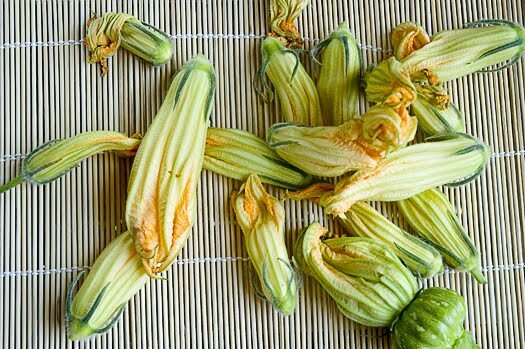 Very carefully open squash blossoms and place a small piece of cheese inside. The amount of cheese will depend on the size of the blossom…you dont want the flower to tear, so don’t over-stuff them. Twist the top of the blossom to seal the cheese inside. Whisk together the flour, parmesan, salt, and seltzer until smooth. Dip the first half of the blossom and allow to slightly run down the second half. Heat 1/2 inch of olive oil to 375 degrees in a cast iron skillet. Fry each blossom 1 to 2 minutes on each side, or until golden brown. Don’t over fry or the cheese will totally run out. Once brown, take the blossoms out and place on a paper towel to drain and sprinkle with a bit more kosher salt. Enjoy! thanks Greg. The batter is seriously delicious. 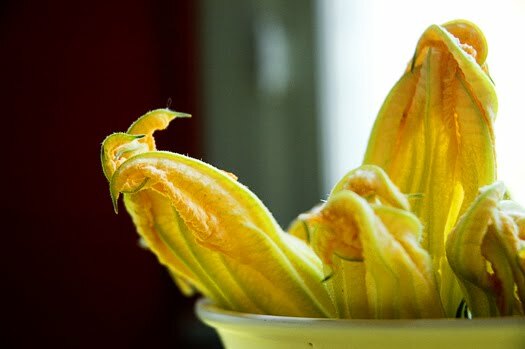 Is there anything else to do with squash blossoms? You could also chop and sautee them with onions and garlic and use them as a filling in quesadillas…both of these methods are really traditional in Mexican cuisine….I think Italians use them also, although I'm not really sure how. I remember seeing a similar batter somewhere – cooks illustrated maybe? I bought blossoms twice in the last month and never had a chance to make them. Such a waste! These are so pretty I might squash (get it *wink*) the idea of eating them and put them in a bowl for decoration instead. Awesome photos.